Large mug of coffee number two? 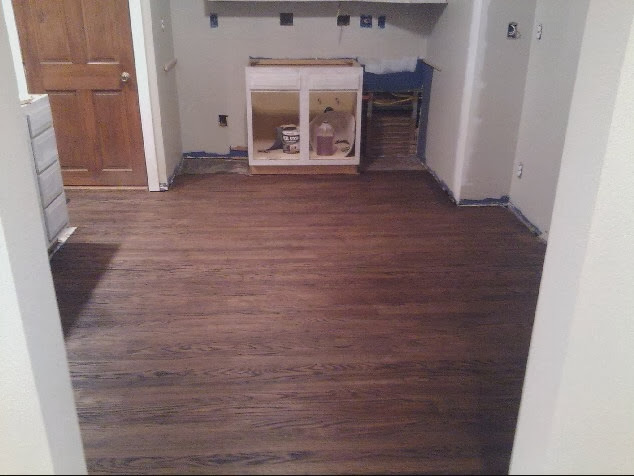 One set of floors done? I have officially called it good enough on the old house floors! One coat of stain, three coats of polyurethane and a whole lot of tears later and I am done. Do not ask me why these floors brought me to tears so many times. I cannot tell you. At least not specifically. I believe it was a combination of not planning on doing them in the first place, and then the amount of hands on time it took and the mental exhaustion block that I have recently hit. It was all these things wrapped up in one that brought me to my knees. But now I have beautiful, shiny floors to set my knees on, so it all evens out I suppose. I don't have many pictures of the process, partly because I cannot find my camera and secondly it was such a hands on project I didn't have much time to take pictures. Here's how I refinished the floors. First I rented two sanders from the local hardware store, one smaller orbital sander and one large-ish belt sander. Several trips were made to town since the old varnish did not want to come off, and the carpenters were tearing through sand paper like there was no tomorrow. Eventually though, we had the floors as good as we could get them. Some varnish remained in really thin strips, but we couldn't get it off and I figured it was just the houses way of reminding us it is old and has stories to tell. 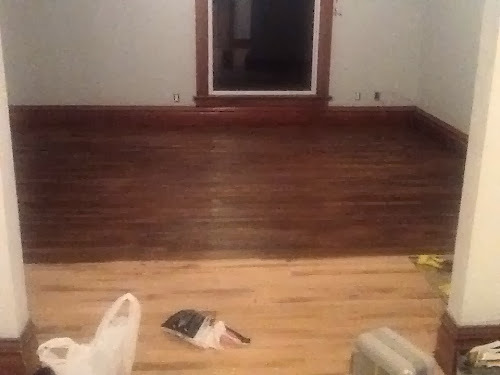 Speaking of stories, to sand the floors we removed the quarter round trim around the baseboards and found remnants of where old doors use to be and maybe even a French door! I love finding hints to the way the house use to be! After we sanded the floors, I cleaned everything really well with a shop vac. 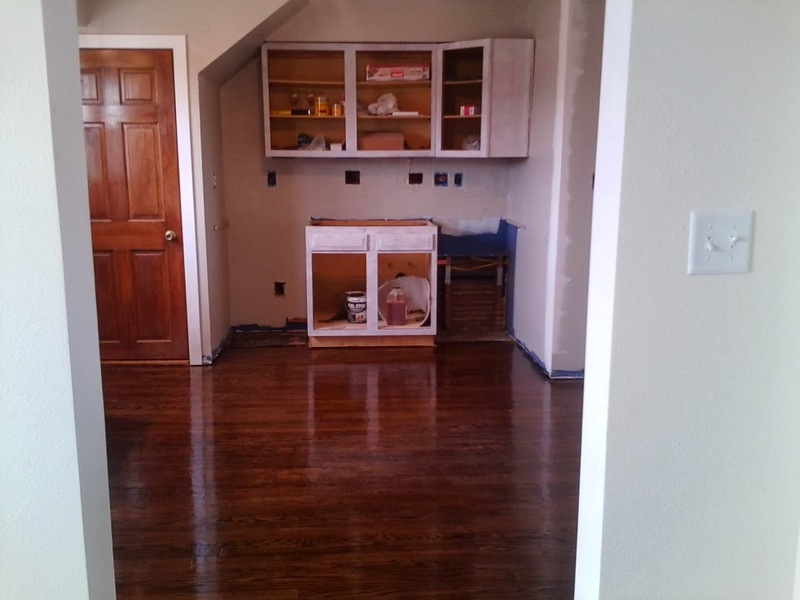 Then I stained the floors using Min Wax's, Dark Walnut. I applied it with a rag and just worked on an even coat. It took me around six hours total to apply the stain. It wasn't a hard process, just time consuming. I did a couple of rooms at a time so it took me about three days to finish. Here is the living room halfway stained. You can see the bare wood at the bottom and the darker stained wood above. Then came the poly. That stuff may be the death of me, and it isn't over yet, but more on that later. I used a fast drying, semi-gloss polyurethane. Once again it's not necessarily hard physical labor, but it is exhausting work. To do roughly seven or eight hundred square feet, it took me over four hours to do the first coat. Since none of the hardware stores sold the supplies I needed, I used a large paint brush and just did it all old school. Inch by inch. I couldn't stop to take much of a break because it does dry pretty fast and I always had to keep what the directions called a 'wet edge' to be able to blend. Four hours with my Darth Vader style mask and crawling around on my hands and knees can be tiring. Then two more coats followed, each taking a little less time than the first. But they are finally done! They have to cure for another 48 hours, and then I can start moving stuff back in. Since the appliances are sitting in the garage I am ready move them in! Next I will start on the new hard wood in the addition. There is roughly three hundred square feet to do there and I cannot wait for this phase to be done. I might be able to get my hands on a different applicator for applying the poly this time and we'll see if it goes any better or faster! Things are really coming together now, and the floors really do look beautiful. So I am glad that I did it, even if there have been moments in the past few days where I looked like a raving lunatic! I'll let you know how the next round of floor finishing goes! Any one out there refinishing floors or have any tips? As always, it's great hearing from you, and thanks for stopping by! Floors after three coats of poly, soooo shiny! Your floors are beautiful! You have worked so hard on this house, I know you must be soooo ready to move in. It will be worth all the stress and exhaustion!